This one is a trippy haunted house tale. A HOUSE AT THE BOTTOM OF A LAKE is excellent. There are several layers to this novella. Underneath the surface, we have a haunted house, but we also have a first love. Josh Malerman captures that feeling of teen angst and wanting to keep relationships fresh and exciting. 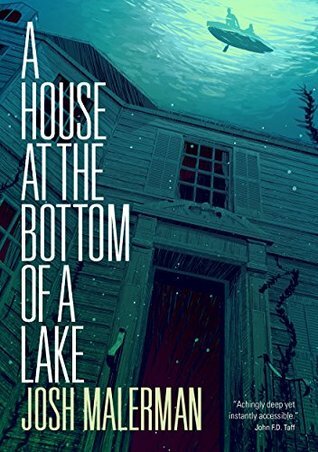 Two teens fall in love and find a house at the bottom of the lake. It consumes their thoughts and their time. They dive down to check it out, eventually getting scuba diving equipment to make it easier to navigate the large house. The house calls them back, longing for their presence. Something resides in the house. They have to find out more. The two lovebirds let days pass without seeing one another. They don’t have anything to talk about except the house. While they are separated, the house beckons them. With there passion ever fleeting, the two need the house as much as the house needs them. It’s all they have to keep their love strong. I had to read this one with the light on. I felt like I was swimming in the house right beside the two teens. I experienced the same things as they did. This reminded me of Channel Zero: No-End House. Yep, it’s that good. It’s a great summer read, too! Grab your swimsuit and floaties and dive right into this one. It’s a short read and a great escape.